This is Mr. Ater’s eighth full year of teaching at CCDS. During the past year he has been working hard to complete his master’s in administration through the University of Ashland. 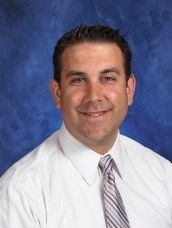 Mr. Ater enjoys Ohio sports teams and relaxes with a good book, movie, or walk through a park. He has been married for eight years to his wife Maureen, has two daughters named Audrey and Grace, and a dog named Pip. “From the moment I began here at Canton Country Day, the staff, students, and parents have been nothing but warm and (have) shown a great deal of excitement for learning.